Although the painter, Dadaist, illustrator, social and political satirist George Grosz is best known for depicting Berlin in the 1920's, his imagination was deeply aroused by America. Most of his childhood was spent reading luridly illustrated pulp fiction by Karl May and James Fennimore Cooper. By 1912, Grosz was busy drawing Western heroes - pioneers, cowboys and Indians, and desperados. Grosz' early hunger for the bloodthirsty and spectacular would not wane. 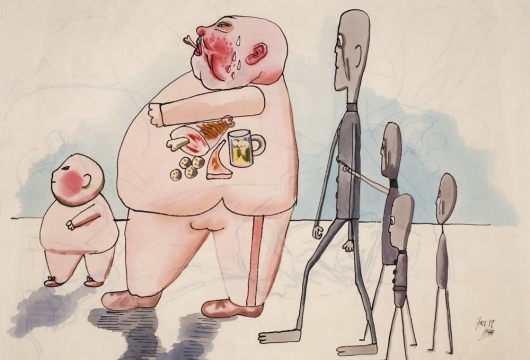 This exhibition contains over twenty pen and ink drawings that mirror the two worlds Grosz inhabited following his flight from Hitler in 1933. While he could not forget the horror that enveloped Germany, he became as completely engaged with New York's spectacle as he had been with Berlin's. Grosz continued to live in New York until 1958, when he returned to West Berlin, which had virtually become an outpost surrounded by Russian and East German troupes. Eventually, he might have become disillusioned with the city, but there was not enough time. In 1959, just three weeks before his 66th birthday, he collapsed and died. This is the first one-person exhibition of George Grosz at Nolan Eckman; his work was included in Art of the Weimar Republic (2002).